Port Wallis is the Friendly Green Church on the Waverley Road in Dartmouth, NS. Welcome to Port Wallis United Church in Dartmouth, Nova Scotia. Our doors and arms are open to everyone. We have a vibrant and dedicated congregation and community at Port Wallis with two services every Sunday; 9:15 am and 10:30 am. We also have many special services during the year, for more details visit our Church Services page. Please join us this next Sunday and become part of our community. You can read our current News and Announcements online. We post our weekly announcements as well as the Bulletin from the 10:30 service. We are a Community Church with many events and happenings open to all. Learn more about our Sunday School program, Outreach, Committees and Like our Facebook Page for more current updates and info. 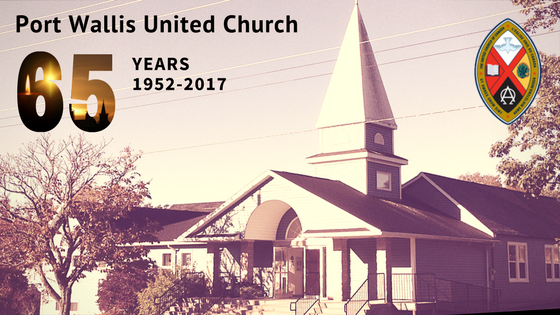 In 2017, Port Wallis United Church celebrated its 65th Anniversary, learn a little more about our history. Email: port.wallis.uc@ns.sympatico.ca for more information. Minister: The Rev. Ivan Gregan, BA, MDiv.